A feminine necklace featuring an ornate antiqued heart pendant with painted pink roses on a turquoise blue background...so pretty! 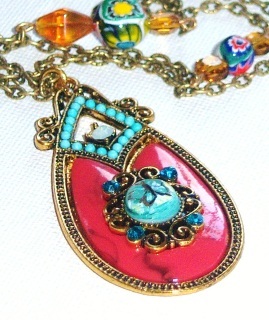 And a lustrous turquoise blue Swarovski crystal pendant swings below, making this piece even more eye-catching! 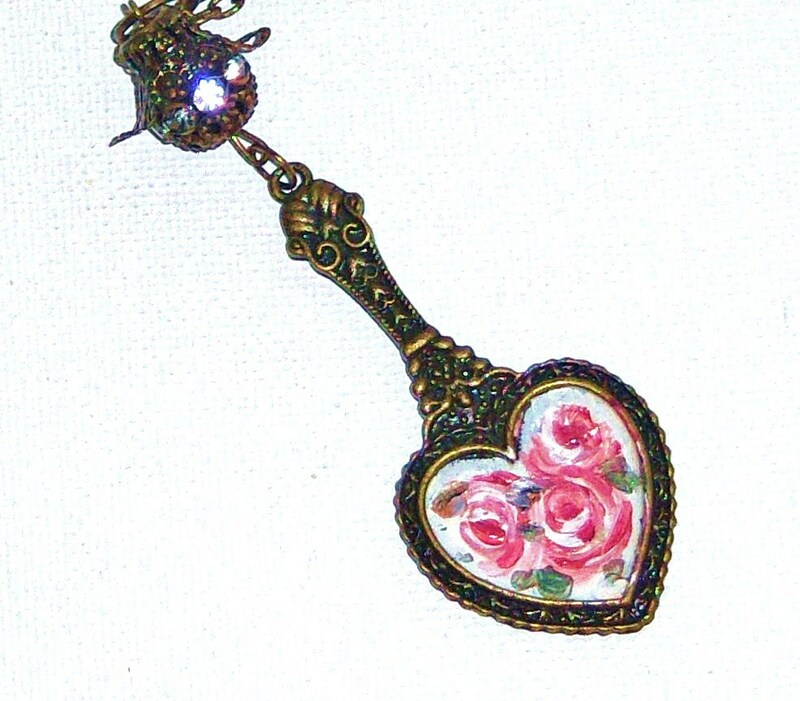 Antiqued Gold Heart Pendant 1 1/4" high, 1" wide, Antiqued gold Necklace w/ lobster clasp 18"-22", Swarovski Crystal Pendant 1/2"
PAINTED TASSEL NECKLACE A unique and artful necklace with a vintage Boho floral style! I painted a pretty floral design onto the antiqued pendant and topped the art with a clear glass cabochon. Below, I placed a ceramic turquoise-colored ceramic bead, featuring a painted rose and a handmade tassel with swarovski crystals at each end of the strands swings below that! 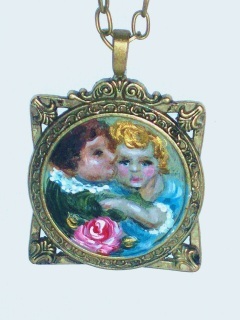 An original necklace to add some romantic color to an outfit! 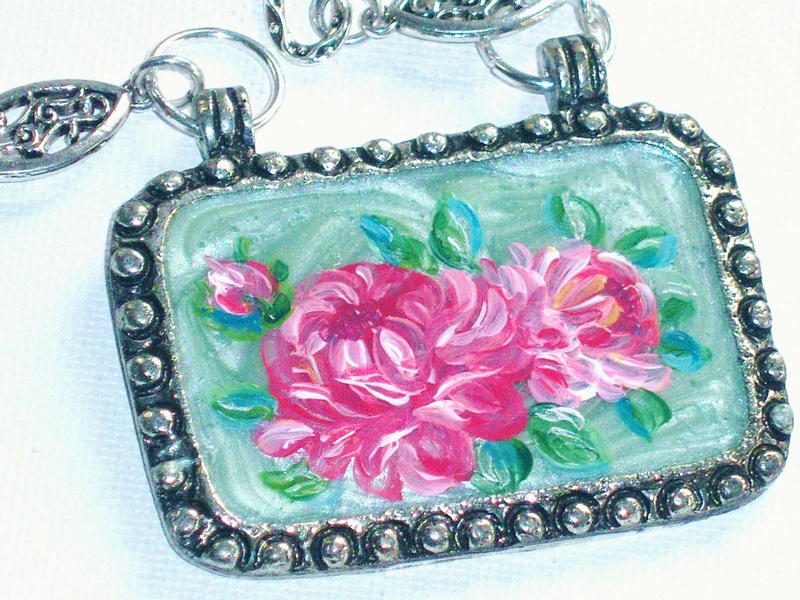 Pendant 2 1/2" high, 2" wide, Necklace 30", Ceramic Bead 3/4", drop almost 40"
BOLD BLOOMS A stunning pendant necklace that is feminine yet makes a statement with its impressive silver pendant framing lovely hand-painted roses in vivid pinks! The antiqued silver pendant is suspended from a linked chain, each of the links' design adding to the beauty of this one-of-a-kind piece of wearable art! And the chain is adjustable...it has a 3 1/2" extender chain! TURQUOISE TASSEL NECKLACE A funky necklace with a colorful, artful vibe...I began with a uniquely-colored porcelain pendant of dark aqua and honey tones, and hand-painted vivid pink roses onto it, capped each end with an antiqued bead cap, and suspended a handmade tassel below. I made the tassel using genuine turquoise beads and Swarovski crystals to add some colorful movement! 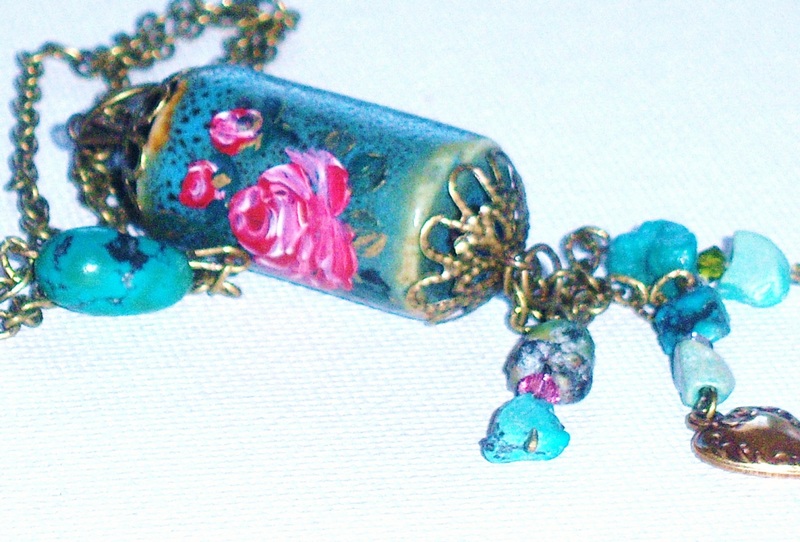 Along the chain, I placed a couple more turquoise beads...a funky yet feminine one-of-a-kind piece! Pendant 1" high, 1/2" wide, Necklace 32", drop 36"
BOLD BOHO An eye-catching one-of-a-kind necklace with Bohemian style that will make a statement worn with any outfit! 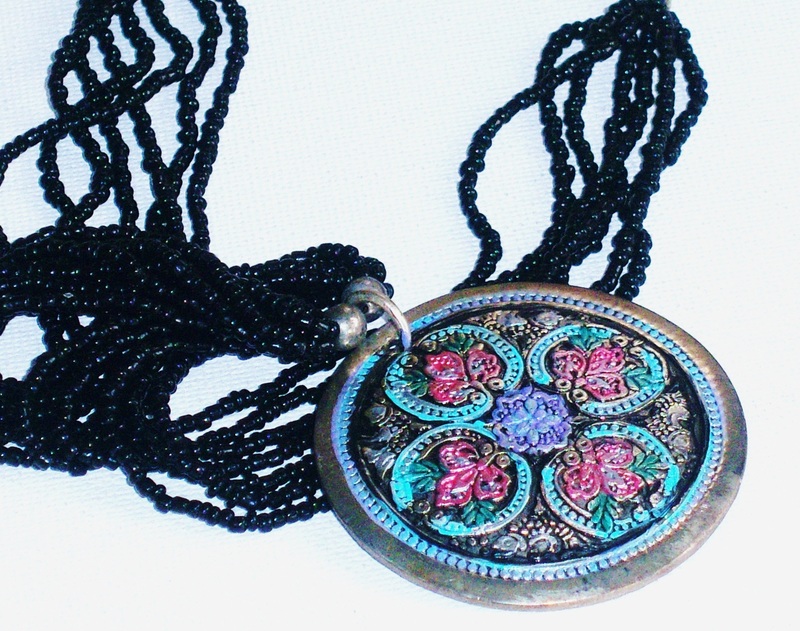 It features a large silver-plated medallion with hand-painted accents in turquoise, pale pink and violet, strung on a multi-strand black-beaded necklace! Pendant 2 1/2" high, 1" wide, Cabochon 3/8", Necklace 34", drop 39"
BOHO BUTTERFLY A vibrant butterfly design, hand-painted onto an antiqued pendant, makes this necklace a piece of wearable art! I used happy colors to lift your spirit every time you put it on, and I added a unique blue bauble and cloissonne bead to accent the painting! 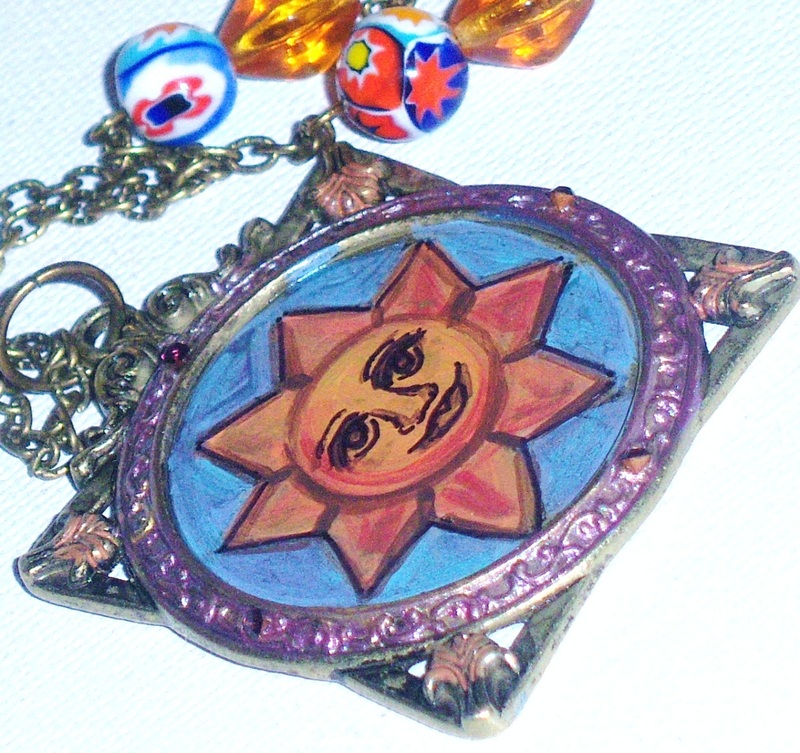 Antiqued gold Necklace 32", Pendant 1 3/4" high, 1 1/2" wide, drop 38"
BOHO SUN FACE PENDANT An artsy pendant necklace with a whimsical Boho feel! I hand-painted my original sun face design onto the pendant frame in violet blue and orange-gold, and enhanced the frame itself with violet accents and Swarovski crystal rhinestones! The design has the slightest shimmer to it...and is well-protected with several coats of durable finish to keep it looking great! 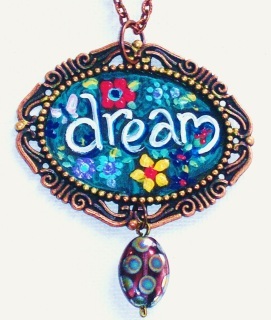 The necklace is accented with a pair of Czech glass beads and funky ceramic beads for an artful touch...ONE OF A KIND! DRAGONFLY ART A necklace with a free-spirited, artful touch! 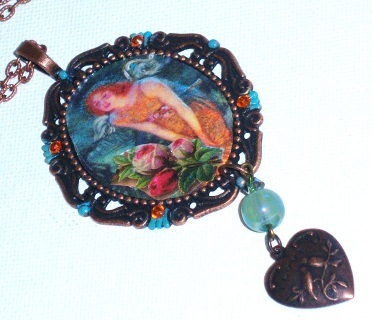 I hand-painted a dragonfly in shades of silvery violet and soft blue onto the quirky-shaped, dark aqua and honey-toned porcelain pendant, adding a few tiny Swarovski crystal rhinestones for a little shimmer. 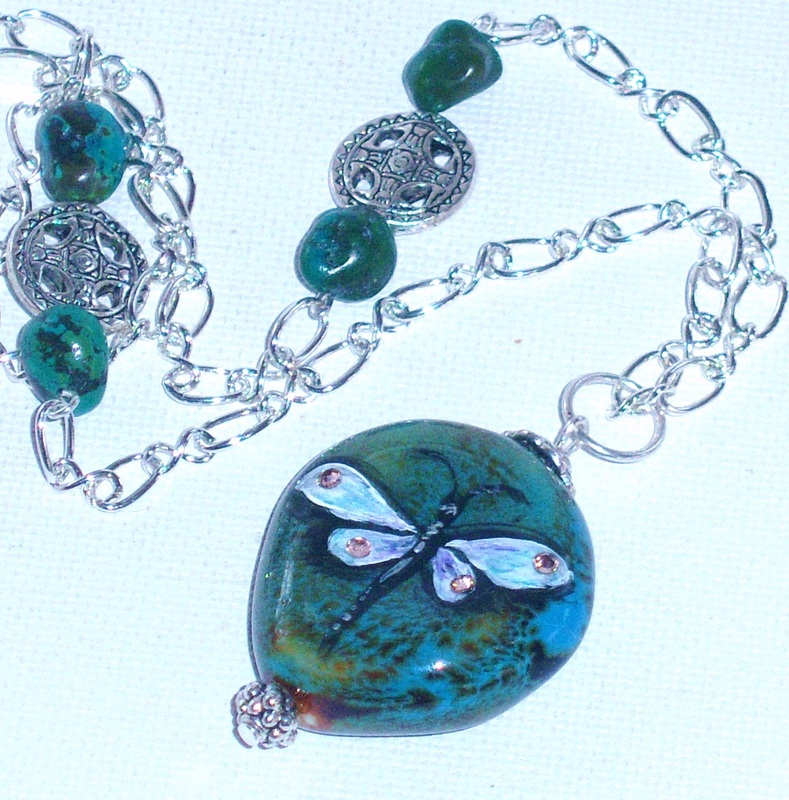 Along the chain, I placed genuine turquoise beads to coordinate with the pendant. It's a nice length for a fun and flirty, relaxed look! 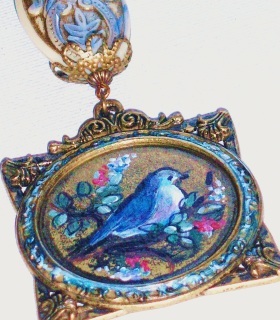 CHARMING BLUE BIRD PENDANT A cute scene...a bluebird sits among flowers on this original antiqued pendant necklace! 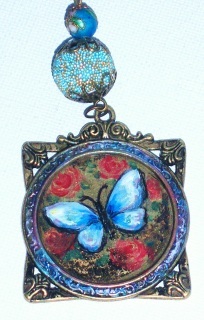 I chose a vibrant palette to make it an uplifting piece...vivid blue, coral, and violet! The pendant's artwork is further enhanced by the hand-tinted,embossed lucite bead above! 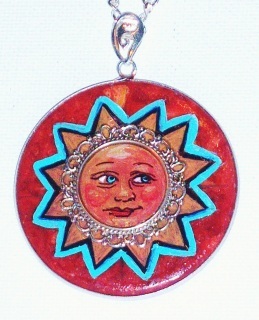 CHARMING SUNFACE A charming painted pendant necklace with an artful, free-spirited Boho personality! It features a hand-painted, expressive sun face painted onto a sterling plated frame, placed onto a larger sterling plated pendant of solid coral...with the painting extending onto the coral! It is suspended from a sterling-plated linked chain to hang whimsically! 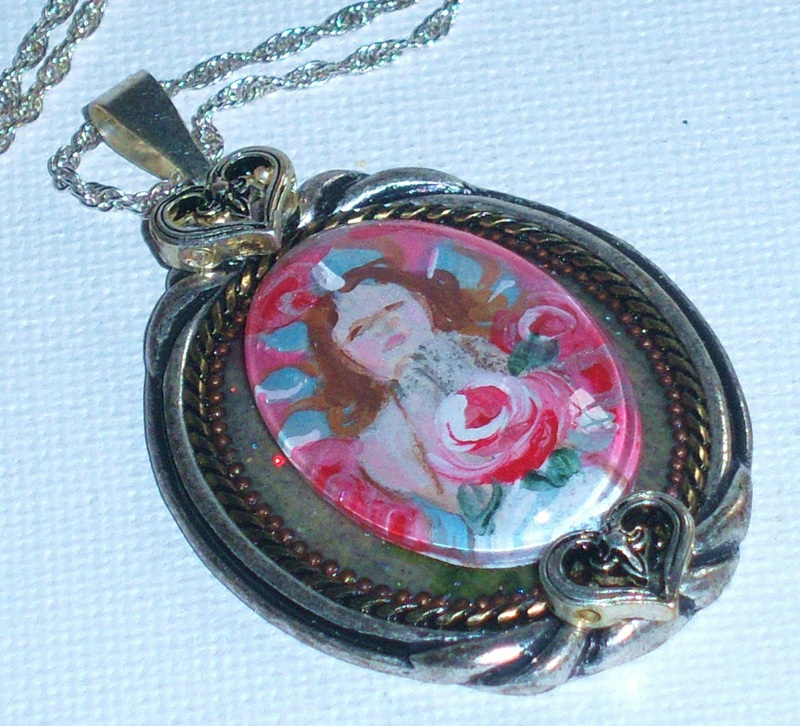 Necklace 24", silver-plated and Coral Pendant 2", drop approx 30"
BOHO ROMANTIC A unique piece, featuring an original painted design of pink florals in an urn against a golden background on a silver-plated pendant! I accented the artwork with tiny pink Swarovski crystal rhinestones, and suspended the pendant from a sheer black ribbon necklace. Underneath, I placed a jet black Swarovski crystal pendant to add a little movement! 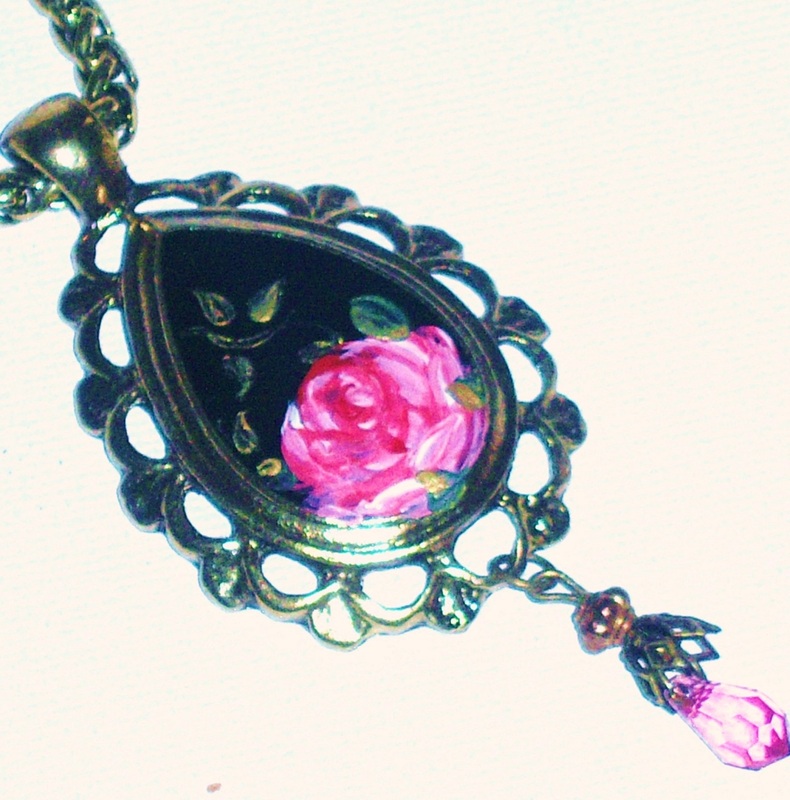 Silver-plated Pendant 1 1/2" round, Adjustable Sheer Black Multi-strand Ribbon Necklace w/ Lobster clasp 18" w/ 1 1/2" extender chain, Swarovski Pendant 1/2"
BOLD ROSE PENDANT A bold, yet feminine necklace featuring an ornate heart pendant with a hand-painted rose design in deep pinks against a black background. The eye-catching pendant is suspended from a chain with decorative details...a stylish statement piece! 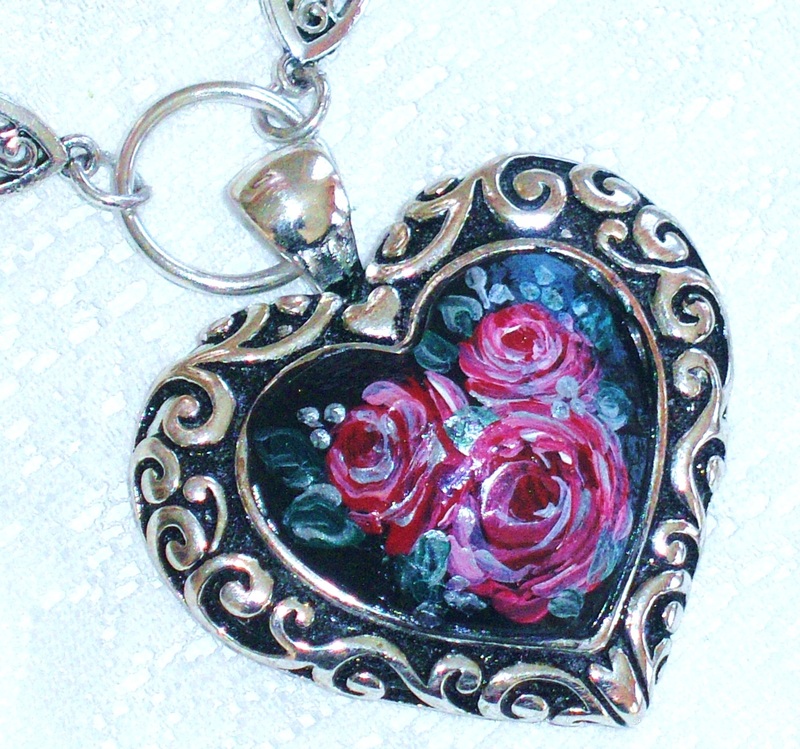 Silverplated Heart 2" high, 2" wide, Silver-plated Necklace 22" w/ lobster clasp, drop 24"
ROSE TEARDROP PENDANT This vintage-inspired necklace features an artfully-painted Bohemian pendant that will add floral charm to any outfit! I loved painting the single bloom in pretty pinks onto this gorgeous teardrop-shaped pendant, and a dainty Swarovski crystal pendant below adds a little pink shimmer! Antiqued gold Necklace w/Lobster clasp closure approx 19" w/ 2" extender chain, Pendant 2" high, drop 24"
BOHEMIAN BUTTERFLY The perfect necklace for that free-spirit! 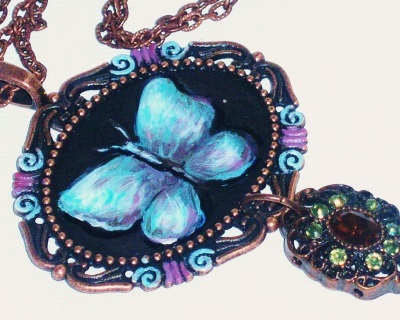 Its artful antiqued copper pendant showcases the hand-painted image of a free-flying butterfly, painted in soft blues and violets...and the frame has painted touches as well! I added a pretty crystal pendant to the piece, just to add some soft shimmer, and the chain itself is enhanced with a couple of cloissone enameled beads and tiny Swarovski crystal beads! It's a nice, long length, too to work well with longer sweaters and tunics, or a dress! Antiqued Copper Necklace 30", Pendant 1 1/2" high, 2" wide, Crystal pendant 1", drop 33"
Antiqued Gold Necklace w/ lobster clasp closure 22", Porcelain Heart Pendant 1 1/8", Pearls 1/2", Black Onyx Hearts 3/8", Swarovski Pendant 1/2", drop 26"
UNIQUE BOHO PENDANT A pendant necklace with a definite Boho vibe! 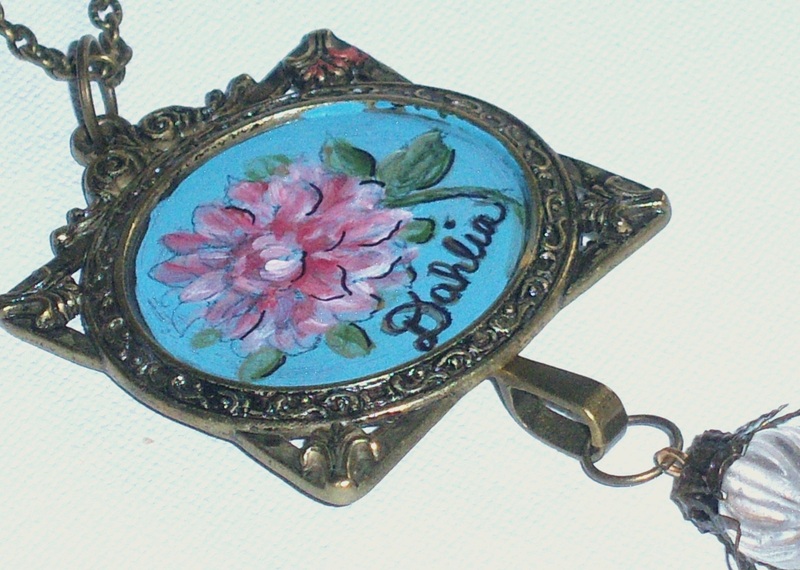 I hand-painted an original floral design onto the vintage-style pendant frame, and placed a protective clear glass cabochon on top! I added a little embellishment to the frame itself to coordinate with some of the colors I used in the central design...I created my own tassel with a "beaded" bead and suspended it underneath, and added genuine black onyx beads to the chain! 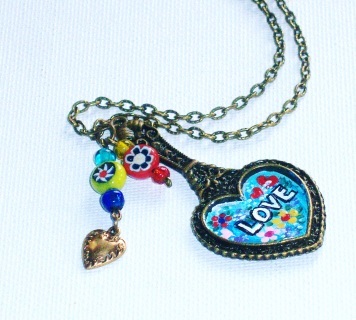 The necklace is a nice, long length and will look fabulous over a tunic or other long top! ONE OF A KIND! 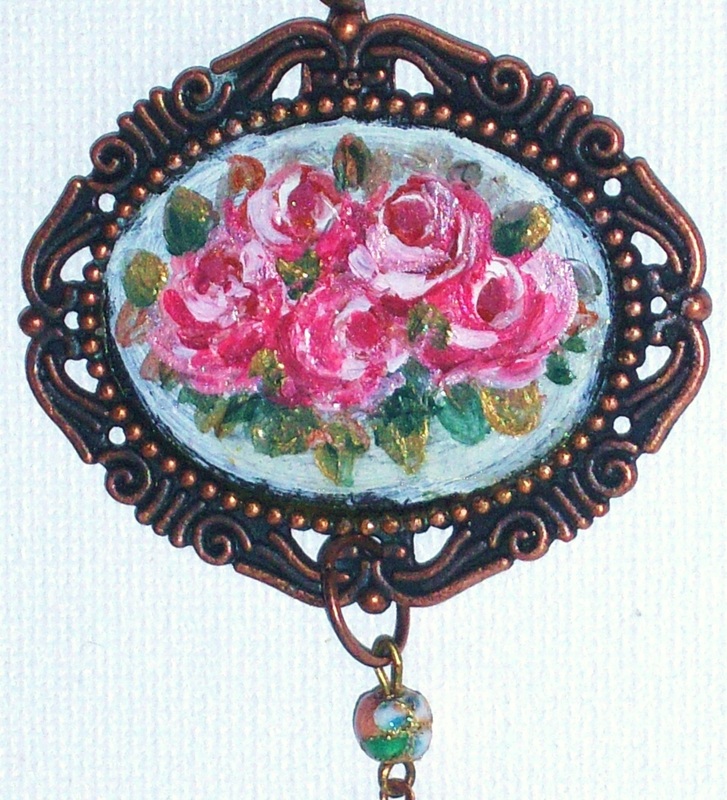 Antiqued Copper Pendant 1 1/2" high, 2" wide, Necklace 30", drop 38"
A necklace with romantic Shabby chic charm, featuring a cream-colored ceramic pendant, decorated with painted pink roses! A ruby red Swarovski crystal pendant sparkles below the pretty floral artwork to accent the roses! 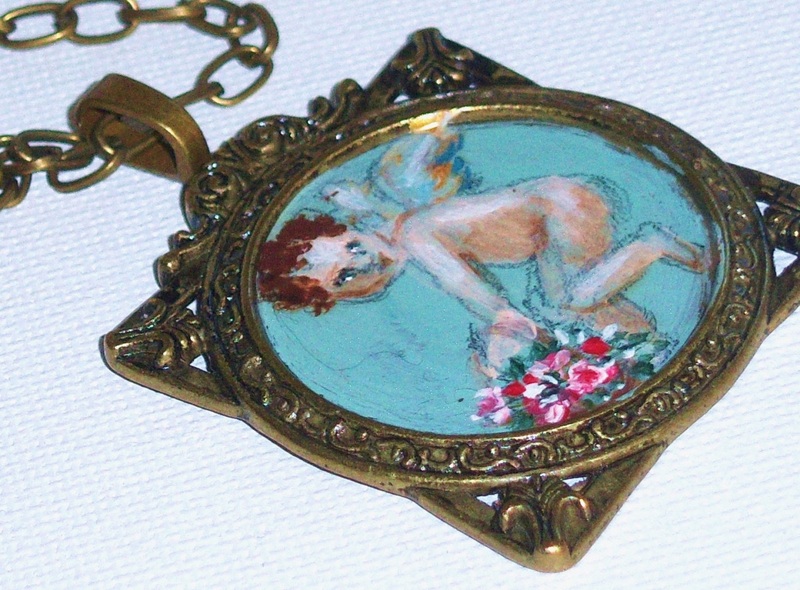 Ceramic Pendant 1" high, 1 1/4" wide, Swaovski Pendant 1/2", Antiqued Gold Necklace w/ lobster clasp 20"-28"
WHIMSICAL FAIRY PENDANT A vintage-look necklace with an enchanted quality...I decoupaged the vintage image of a beauty leaning over a cluster of roses. I added some hand-painted touches and sealed the decoration. 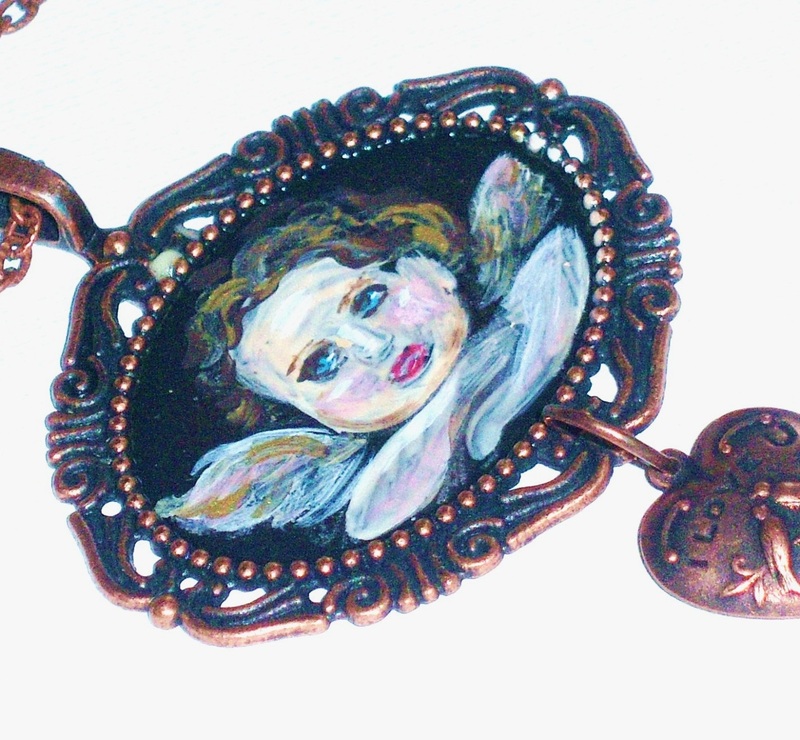 The antiqued copper frame is decorated with sparkling Swarovski crystal rhinestones and painted accents...below, I hung an embossed copper heart charm, a glass bead, and a Swarovski bead... a one-of-a-kind piece! Necklace 24", Painted Pendant 2" wide, 2 1/2" high, heart charm 3/4",drop 32"
A romantic necklace with a vintage feel featuring a nice-sized Victorian pendant with a gorgeous painted rose design under a clear glass cabochon! 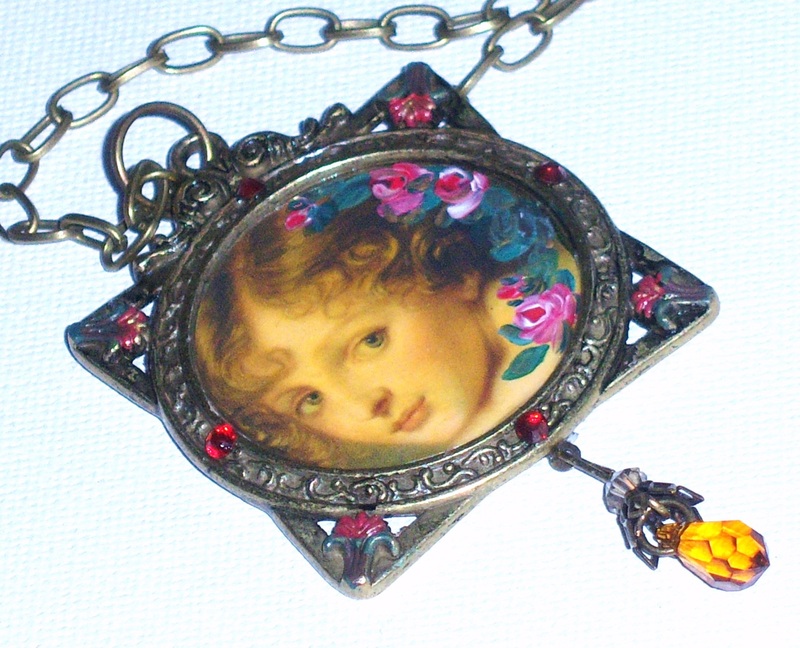 The ornate frame is decorated with tiny Swarovski crystal rhinestones, and below swings a Swarovski crystal pendant, adding red luster! Choose your length for the perfect wardrobe addition! Antiqued Gold pendant 2 1/2" high, 2" wide, Swarovski crystal pendant 1/2", Antiqued Gold Necklace w/ lobster clasp 22"-30"
FLIRTY FLORALS A romantic floral Boho-inspired necklace with happy vivid colors! 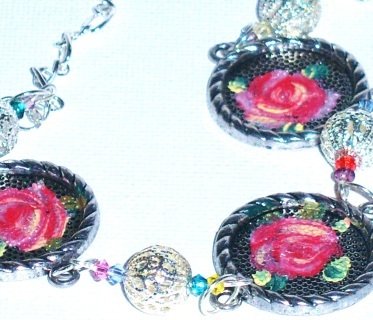 This multi-pendant piece has a vibrant charm, with each pendant featuring hand-painted roses, and rows of sparkling multi-colored Swarovski crystals dangling below and to sides of the pendants....a fun and funky one-of-a-kind necklace! A CLUSTER OF PINK ROSES I love this one! 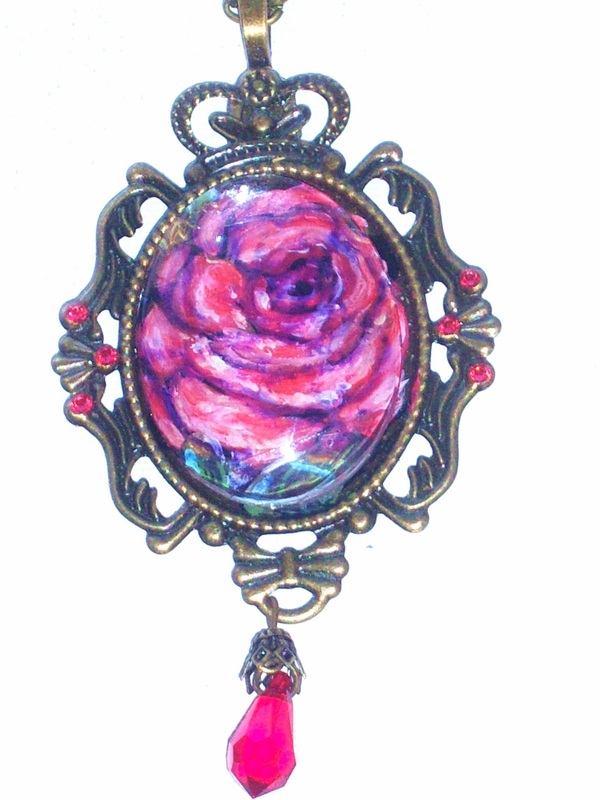 It was modeled after a pendant necklace I had inherited from my grandmother...A one-of-a-kind piece of Bohemian/Victorian-inspired jewelry with hand-painted vintage florals! 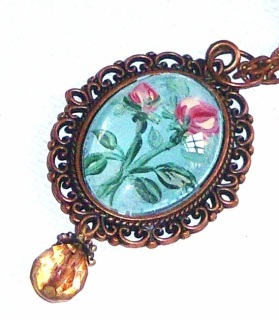 This antiqued copper necklace's focal point is the pendant and the colorful cluster of heirloom roses it displays. 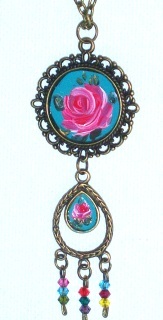 A couple of glass crystal beads in soft green enhance the chain and a tiny cloissone bead and rose charm dangle from the frame...Romantic floral Bohemian charm...gorgeous over a tunic! ANGEL ART PENDANT A cute cherub in a restful pose... hand-drawn & painted within an antiqued-copper framed pendant using my tiniest brushes! 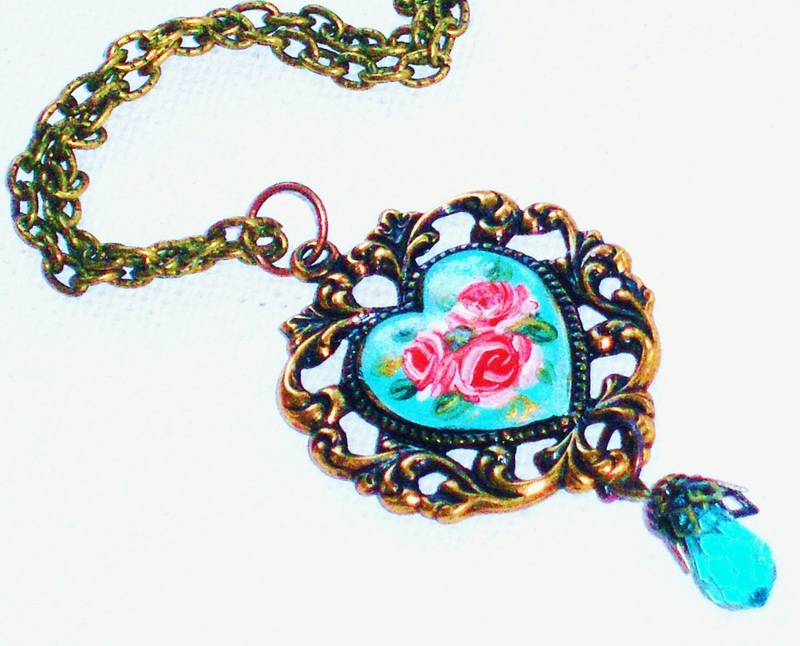 Also features a dangling heart charm & a couple of crystal beads set within the linked chain..This one-of-a-kind art piece will add a Vintage charm to your wardrobe! 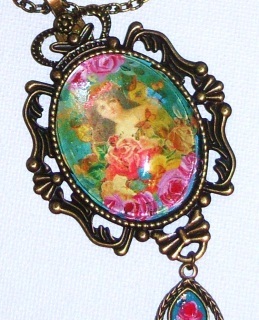 20" chain w/ 23" drop, lobster clasp, pendant 2"
VINTAGE STYLE I started this piece with an antiqued gold pendant frame, then decoupaged the sweet retro image onto the pendant and enhanced both it and the ornate frame with painted accents. 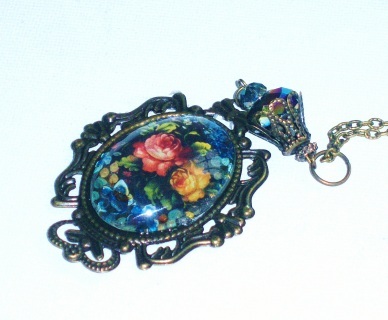 The final touches were the Swarovski crystal rhinestones on the frame, and the beautiful, shimmering Swarovski crystal pendant dangling below...a very unique piece! 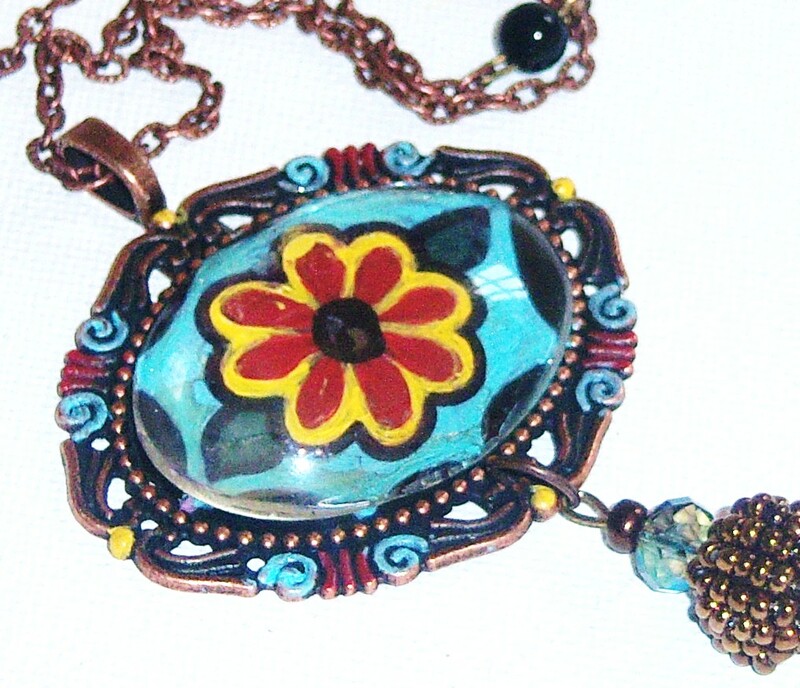 Antiqued Gold Necklace 24", Pendant 1 3/4" sq, Swarovski Crystal Pendant 1/2"
Necklace 28", Pendant 2 1/2" high, 2" wide, Lampwork Beads 1/2", drop 32"
BOHO GODDESS **SOLD**...contact me if you would like me to create a similar piece for you! 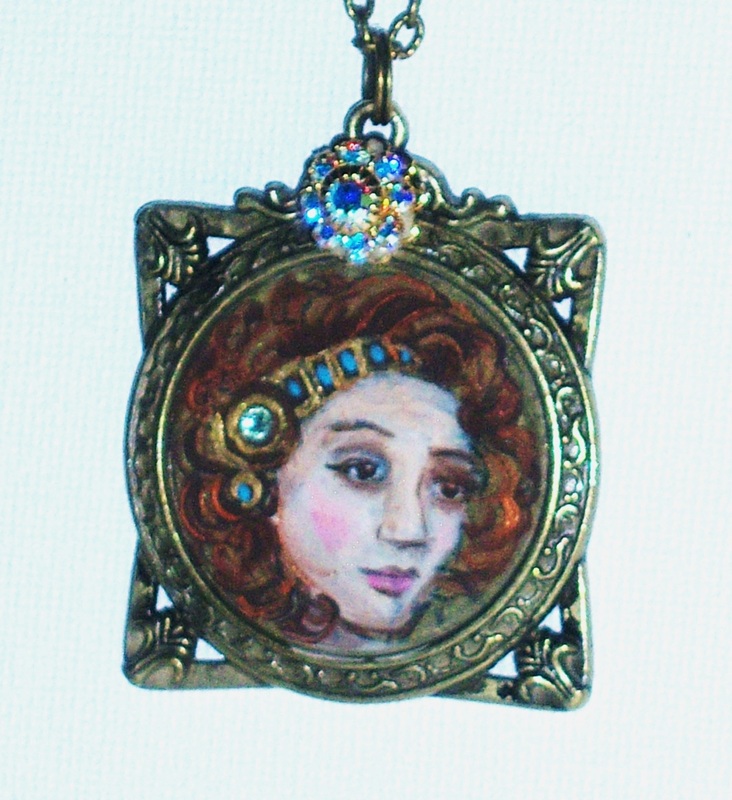 A painted pendant featuring a lovely Pre-Raphaelite goddess with a headband, accented with the tiniest Swarovski crystal in her auburn hair. A Swarovski crystal medallion on the antiqued gold vintage-style frame above the artwork catches the light! So unique, this piece features an original Bohemian goddess for the modern goddess to wear! ONE OF A KIND! 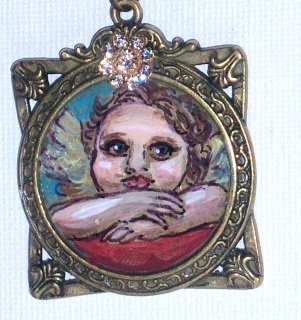 Necklace 24", drop 26", pendant 1 3/4" high, 1 1/2" wide, Swarovski crystal medallion 1/2"
HEAVENLY ART PENDANT NECKLACE A cherub w soulful eyes adds innocent charm to this antiqued gold pendant. What a face! ( I should know, I painted it! : ))...in a pretty and ornate frame, embellished with a sparkling Swarovski crystal medallion detail...A one-of-a-kind wearable work of Art! BOHO DREAM An artsy pendant necklace featuring colorful florals on an antiqued copper pendant, and a genuine Czech glass bead below! The colorful flowers stand out against the muted blue background, and the glass bead has a funky, dotted design! PRE-RAPHAELITE BEAUTY This one-of-a-kind necklace is an ode to the lush & lovely artwork of the Pre-Raphaelite era. The beauties of the day were often the painters' chosen subjects...they were the goddesses of their day! 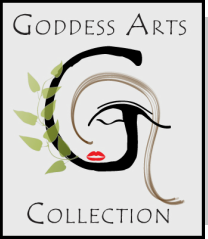 This goddess is painted on an antiqued gold pendant frame, her outfit in tones of jade, and her flowing hair captured in shades of chestnut brown, with glimmers of topaz highlights. The frame is embellished with dainty siam-hued Swarovski crystals, and below the artwork dangles an antiqued rhinestone-studded bead accenting a lustrous Swarovski pendant....a true ARTPIECE! ONE OF A KIND! 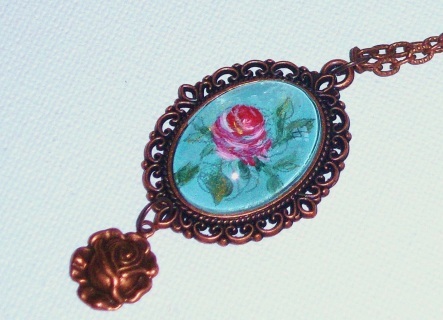 Necklace 28" long, 34" drop, lobster clasp, antiqued pendant 1 3/4" high, 1 1/2" long, Swarovski crystal pendant 1/2"
ANTIQUED COPPER ROSE PENDANT NECKLACE A vintage-inspired necklace with feminine charm! 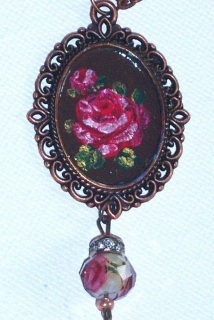 the antiqued copper pendant is embellished with a hand-painted center, a rose design in pretty pinks...and below the pendant, a faceted glass bead with a tiny rose design and a little rhinestone-encrusted bead hangs gracefully. A pretty piece with Bohemian charm! 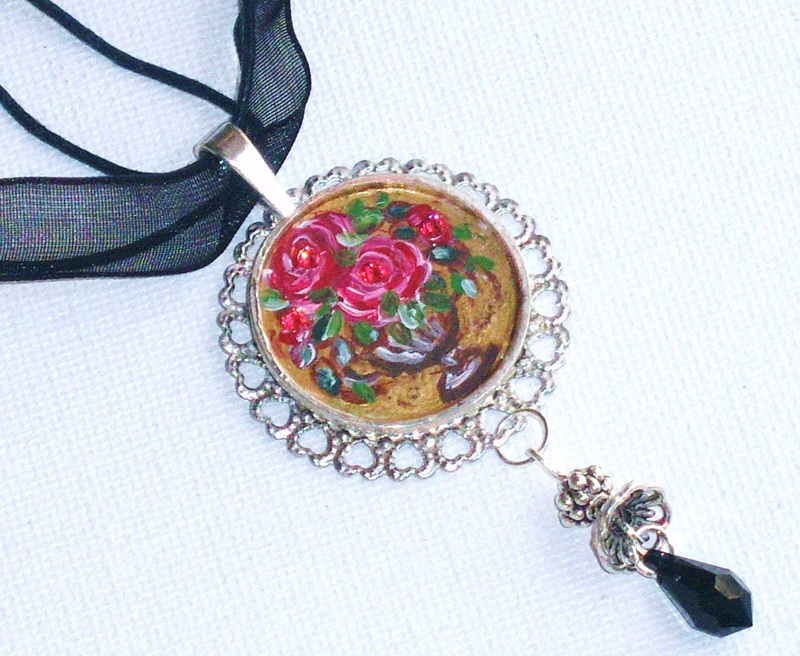 BOHO GLAM A one-of-a-kind necklace with a floral Bohemian look! 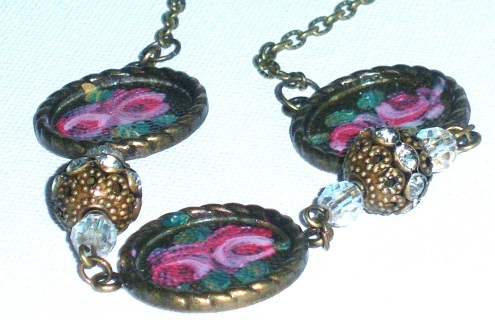 Its three antiqued pendant frames showcase painted rose centers, each design hand-painted and sealed with a protective finish... rhinestone-studded accent beads and clear crystal beads add a little lustre and vintage style. 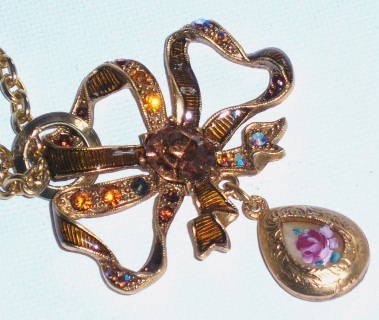 A one-of-a-kind piece to add a touch of nostalgic charm to an outfit! Necklace 26" long, lobster clasp closure, Painted pendants 1", rhinestone beads 7/8"
GOLDEN GLAM A casually-elegant, eye-capturing necklace, with a graceful bow-shaped pendant, encrusted with lustrous rhinestones. 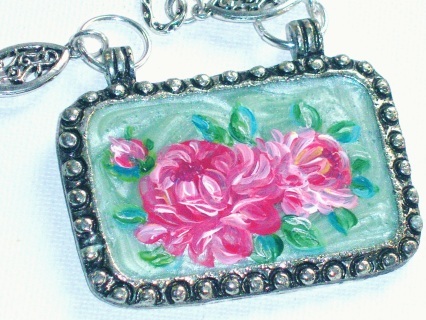 A hand-painted charm below adds to the feminine floral appeal! 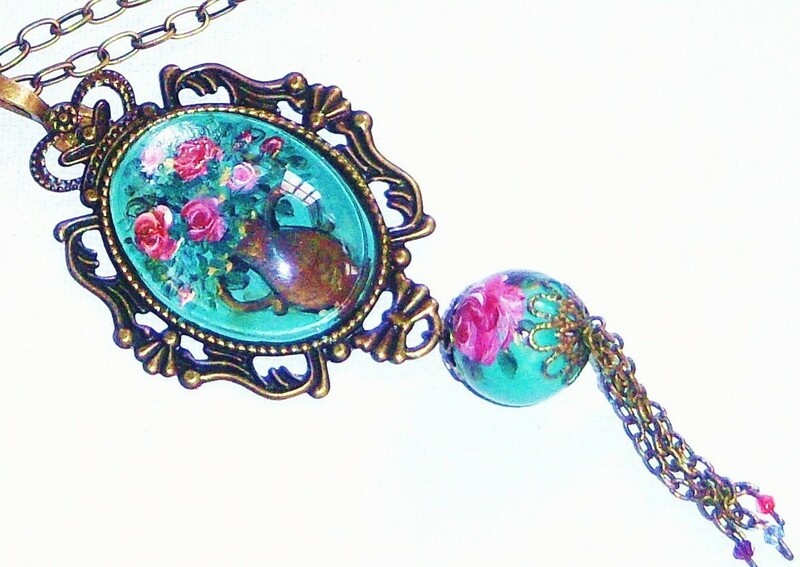 Necklace is 24", with a 26 1/2" drop....so unique! FLORAL ROMANTIC PENDANT An antiqued copper pendant hangs from an antiqued copper necklace to make a pretty statement over a tunic! 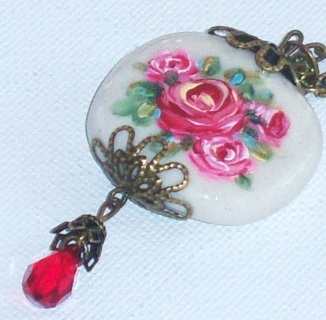 I painted a single rose in soft pink onto a soft blue background and placed it under a clear glass cabochon. I added an antiqued copper rose charm to add to this piece's vintage and feminine appeal... 19" necklace, 21" drop, pendant 1 1/4"
BOHO COLOR A unique, one-of-a-kind Silver-plated necklace with artful appeal. 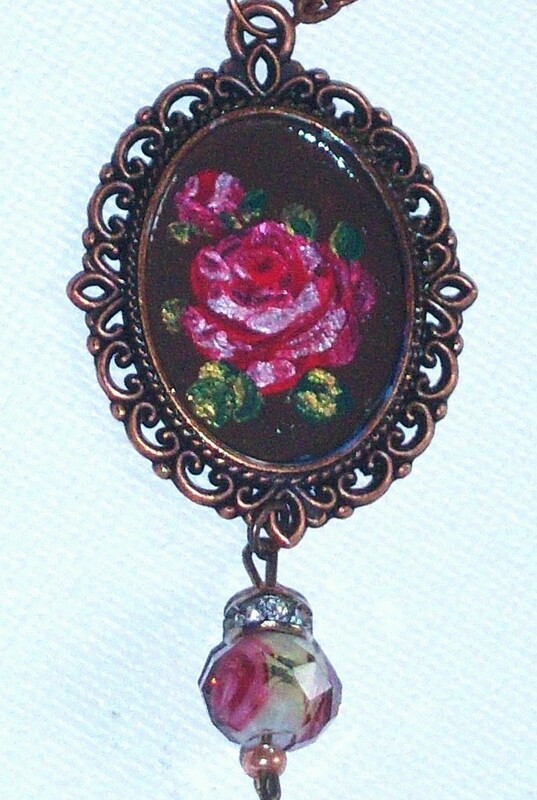 Hand-painted roses I painted in romantic pinks tones, are featured on each of the three pendant frames, and I made sure to coat the artwork with protective finish to ensure the design stays pretty...filigree baubles and tiny multi-colored Swarovski crystal beads add charm and little pops of color! 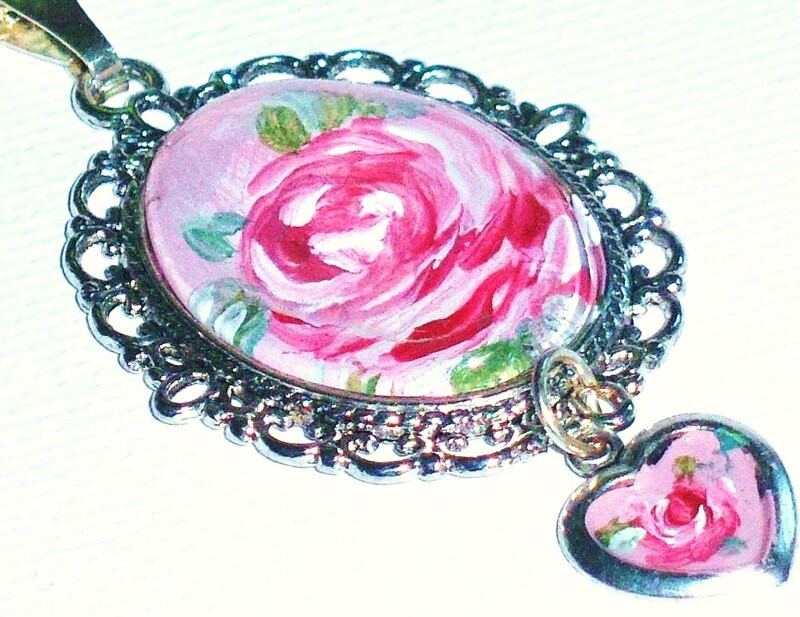 Silver-plated Necklace 22" long, lobster clasp closure, painted pendants 1"
PINK ROSE NECKLACE A necklace with a hand-painted blooming rose under a clear glass cabochon on a silver-plated pendant frame....and there's even a pretty painted heart charm dangling below! 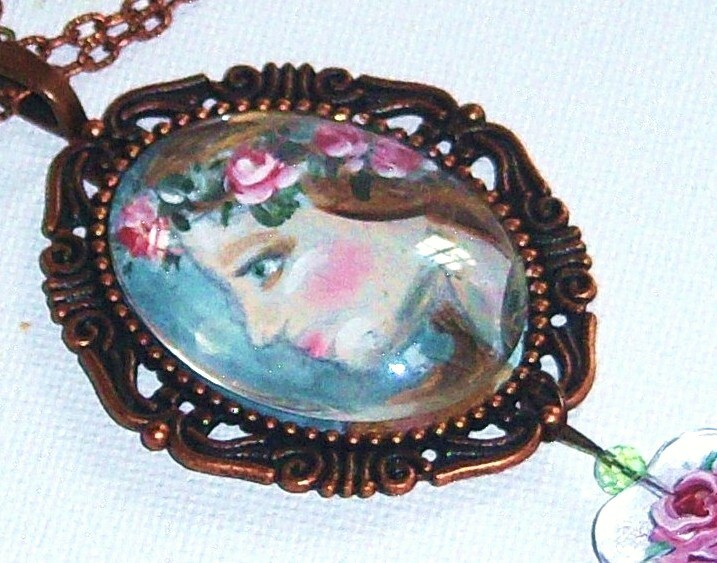 ....18" Silver-plated necklace, pendant 1 1/2"
ROSE DESIGN PENDANT An antiqued gold pendant frame, featuring a cluster of roses I hand-painted on a cream background, is an eye-catching focal point for this romantic Bohemian floral necklace....an antiqued bead w/ inlaid Rhinestones adds a little sparkle! Perfect over a tunic! ONE OF A KIND! 20" necklace, pendant 2 1/2", drop 26"
BOHO CHIC FLORALS A chic statement pendant necklace featuring a large, antiqued gold pendant, decorated with decoupaged and hand-painted florals in pink, yellow and blue under a clear glass cabochon! 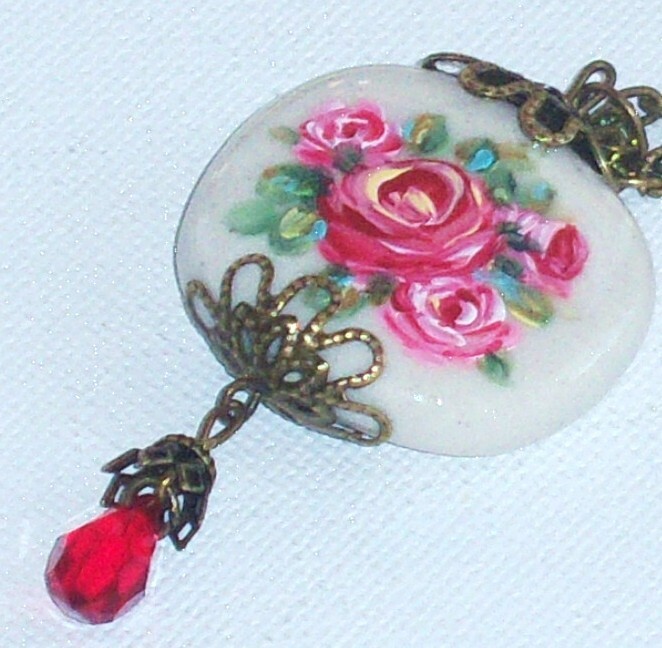 Above, a lustrous crystal bead shimmers in pinks and blues under an antiqued bead cap! Pendant 2 1/2" high, 2" wide, Crystal Glass bead 1/2" wide, 1/4" high, Necklace w/ lobster clasp 24"
HIPPIE LOVE An expression of love on a colorful, hand-painted pendant with multi-colored,dangling ceramic beads that will add some color and Boho style to your outfit! Antiqued gold necklace w/ lobster clasp 20"-30"( your choice! 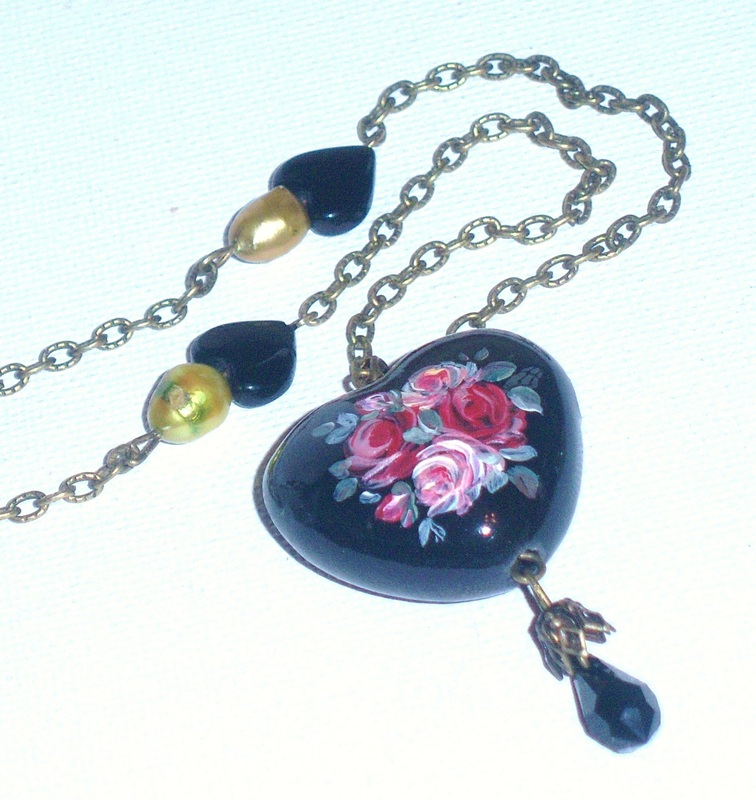 ), Heart Pendant 2 1/2" high, 1" wide, Beads 1/2", heart charm 3/8"